When developing mobile applications, a common need is to be able to perform some task (long-running or otherwise) off the main thread and ensure that your main thread can respond appropriately when it completes. There are multiple ways to accomplish this sort of requirement, but I’m going to focus on how to handle it using the MessagingCenter. I covered a fairly simple “call and response” usage of MessagingCenter in my previous post for creating a Creating a Cross-Platform Soundboard, this one will leverage similar concepts but take things a bit further. 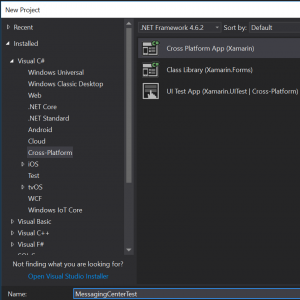 We’ll start out in Visual Studio and create a project of type Visual C# -> Cross-Platform -> Cross Platform App (Xamarin). 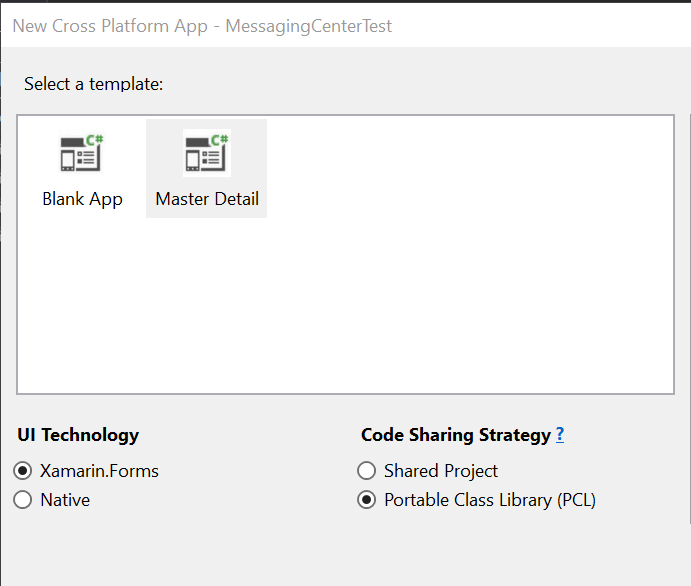 On the next screen, select Master Detail for the template and Portable Class Library (PCL) for the Code Sharing Strategy. 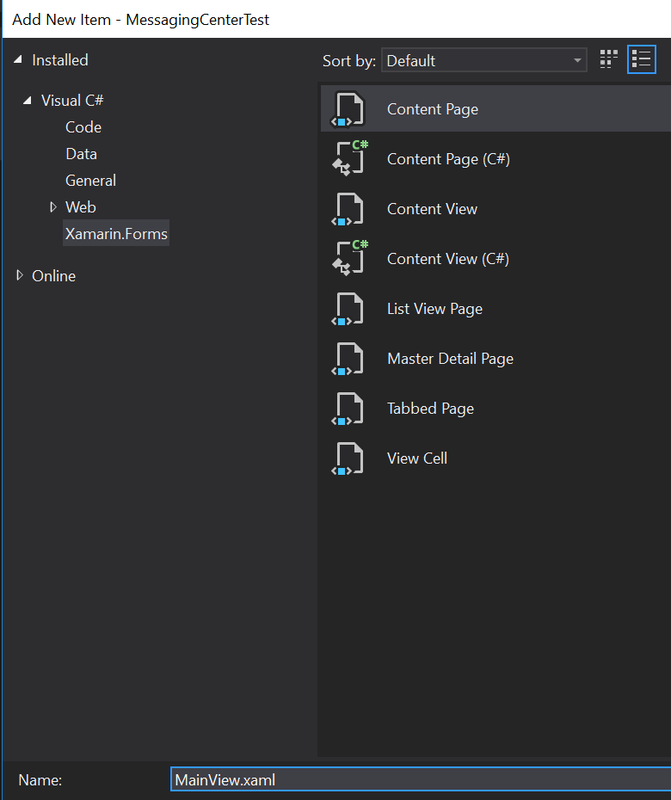 Churn, churn, churn goes the Visual Studio for a bit and then you’ll be prompted to select the UWP targets, I’m just going to leave them set at their defaults and hit OK.
Now that we have a mostly clean project, we’ll begin building back up our sample application. 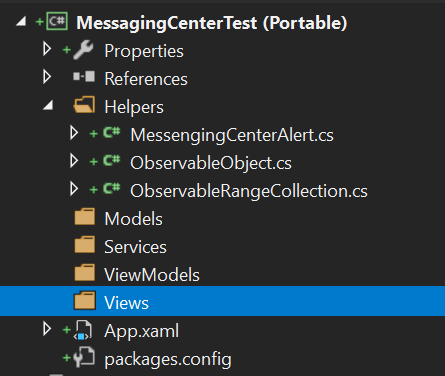 Right-click on the Helpers folder, select Add -> Class and give it a name of MessagingCenterObject. 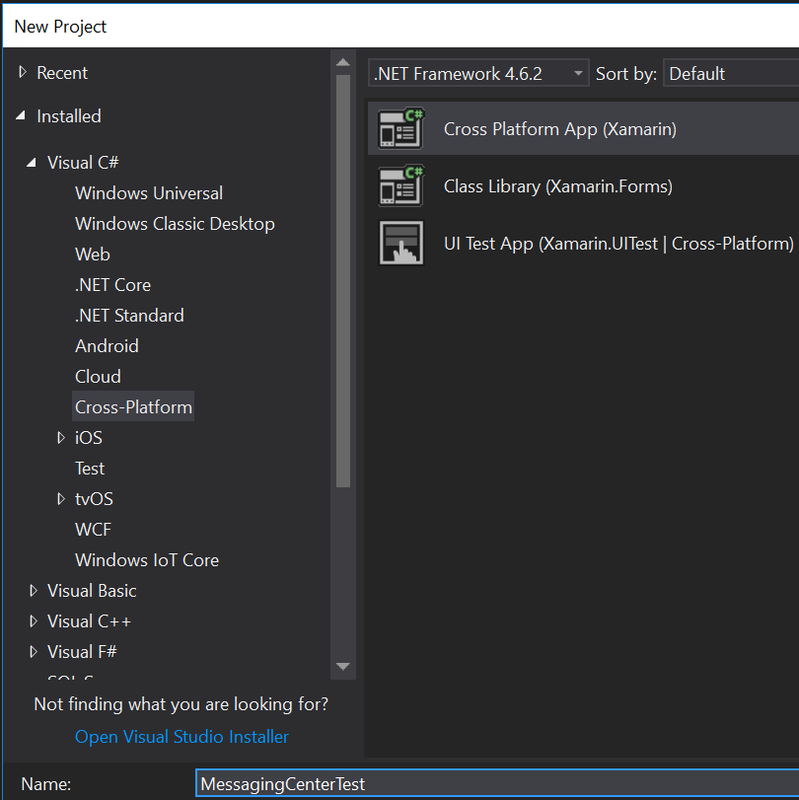 In the new class file that opens, give the class a public accessor and add two public properties of type string: result and message. The next piece we want to add will be a ViewModel. Right-click on the ViewModels folder and select Add -> Class. For the name of the class, put in MainViewModel.cs and then click Add. For the view, we’ll use a simple Grid with two rows, one for a text label and one for a button. Right now, if you run the project, you will get a display that has a label that displays “Waiting to Start” and a button. Clicking the button wouldn’t have any effect at this point because we are sending a message but no one is listening (sad, I know). Let’s provide something to listen and respond to the message. Right-click on the Helpers folder, select Add -> Class, and give the file a name of BackgroundListener.cs. Modify the class so that it is public and static. 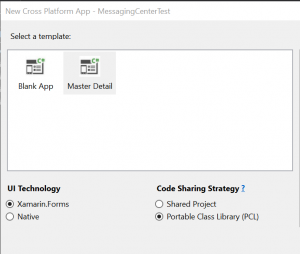 We’ll need to do a few things in here to get it prepared properly: create a few static properties to help maintain state, provide a static method to initialize the class, and set up our MessagingCenter subscriptions. Our example is going to be very simplistic, the background process is just going to wait for a set period of time and then send a message back out saying it has completed a processing round. In the real world, you could use this for things such as reaching out to a web service to periodically refresh data, polling for other application updates, etc. The code for the BackgroundListener class is below, it’s commented to explain what the different pieces are doing. 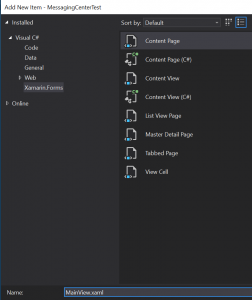 Before testing this out, we have two more adjustments to make; we need to modify our MainViewModel so that it subscribes to the FinishedProcessing event and add a line to our App.xaml.cs to spin up the BackgroundListener. At this point, you can run the application on any of the platforms and be able to watch the call-and-response between your ViewModel and the background listener process. 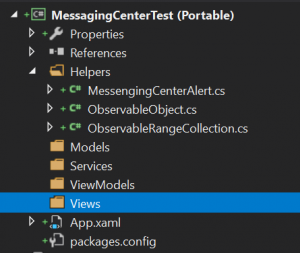 In the next post, I’ll go over some slightly more complex concepts with MessagingCenter such as handling messages across multiple views and how to properly unsubscribe from MessagingCenter events to ensure you keep your event stack clean.